This was supposed to be a tiny Samurai Gunn fangame based on an impromptu bullet-deflecting tennis standoff game we invented on that bridge map. You know the one. 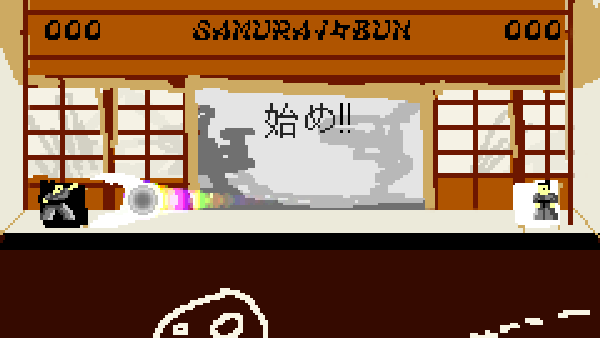 Samurai Bun was a 2015 collab between @monkeyotoshi and myself, but it never really went anywhere. I experimented a bit with freeze frames and weird effects, but the mechanic just isn't satisfying enough and I suspect it would work a lot better if the projectile would move in two dimensions. But at that point we'd have basically reinvented pong, and that's where we kind of abandoned this project, I think. Press A for the left guy, B for the guy on the right. Buttons can also be held for an eyedscreen-inducing charged shot. Swap palettes with P. Hold POS1 or END to slow down or speed up time. Reset the game with BACKSPACE. P.S. 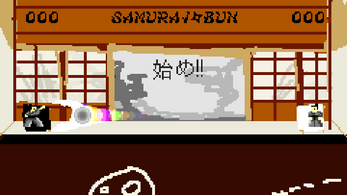 go buy Samurai Gunn, it's fantastic.